Consignment shops are not only a good way for RV full-timers to make some extra money, they can be medicine for the garage sale junkie. A full blown yard sale addict can make a crack head seem well adjusted and rational. If you’re planning a garage/yard sale for 8 am and there has been an old Volvo station wagon parked across the street since 3 am, it’s probably a yard sale junkie. It’s ok. They just want the first shot at the good stuff. 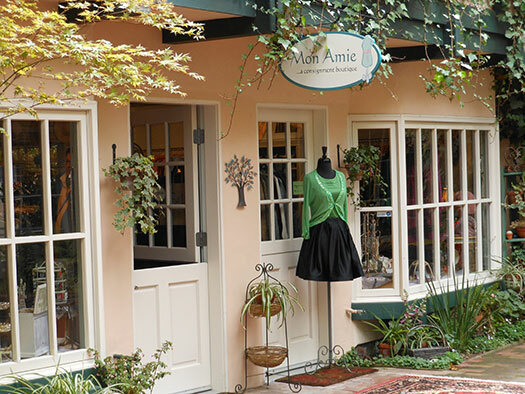 As long as you avoid eye contact and show no fear you should be ok.
Mon Amie…a women’s consignment boutique is a popular shop in Carmel-by-the-Sea, California. Not only is Mon Amie in a great beach town, Kimberly and her hubby are RVers in the process of retro-fitting a classic RV. Hopefully they will share a couple of photos when it’s finished so I can post them here. A consignment shop is where you bring the good stuff you no longer want or have room for. The owner of the shop displays your stuff, along with other people’s stuff, and sells it. You and the owner of the store split the sale price…on your stuff. If you like going to garage/yard sales or flea markets to look for treasure, consignment shops are perfect for you. As an RV full-timer it may be difficult for you to organize your own yard sales but you can take your treasures to local consignment shops and sell them there. Some shops are set up to rent you floor space. I was in Red Bluff, California and found a shop that rents floor space. They let each renter set up their own display and decorate however they want. Walking through the store is like walking through an indoor street fair or flea market with lots of different themed booths next to each other. There was a western/cowboy themed booth selling really nice leather belts, wallets, boots, and other items. Next to that was a 70’s themed space selling lava lamps, mood rings, beads, and tie dyed clothing. The sellers (renters) had each created a cool little display to showcase their products. These sellers can get some business cards printed and promote the shop and their business at the same time. Maybe they could work out a better deal with the shop owner since they will be actively promoting the shop along with their own business. The point is there is lots of room for guerilla marketing. Sellers could, and probably should, look for ways to promote themselves and the shop in which their products are displayed. Suddenly it goes from selling a few personal items to running a small business out of someone else’s shop. It’s a great way to have a “brick and mortar” business without all of the hassles. These folks can spend their time finding more stuff to sell and promoting their businesses while someone else handles the actual selling. In other words, more margarita time. Some shops will charge a percentage per item sold. The split seems to be from 25% to 50%. The shop keeps the bigger slice since they are the one with all the overhead. Some shops will charge for both floor space and a percentage. Most stores will have a “standard” agreement already written up and ready for you to sign. Read it carefully. What happens in case of fire or burglary where your items are lost? Are you covered by their insurance? If you are selling expensive art and crafts you may want to write up your own agreement. Work only with shops that have a good reputation. · Good location with low crime rates, easy and free parking, lots of foot traffic. · A well organized and clean shop. · Their posted policy on their pay rate, return policy—what happens if an item doesn’t sell, record keeping, insurance coverage. Good shops will not sell junk. They are interested in stuff that is clean and in excellent condition. They will not accept clothes that look worn, smell like smoke, or are covered in pet hair. It’s good to have receipts for the stuff you’re selling. Usually shops pay on a predetermined date/end of the consignment and not as the items are sold. Be prepared to wait a bit for your margarita money. 1. Find stuff to sell. 2. Find consignment shops in your area. 3. Visit the shops to see what they are selling. Talk to the owner or manager. 4. Bring your stuff to the appropriate shop. 5. Keep records of who has what and when you need to take the unsold stuff back. Read the agreement. Consignment shops are a great way to make some extra money. You can sell your unwanted stuff for a few bucks or you can turn it into a small business with very low start-up costs or overhead. If you're interested in owning your own shop you can always go the bumcave (pronounced BUM KAH VAY) route.